The rubber band method: section your natural hair in 1-2 inch parts and securing each part at the root with a rubber band. 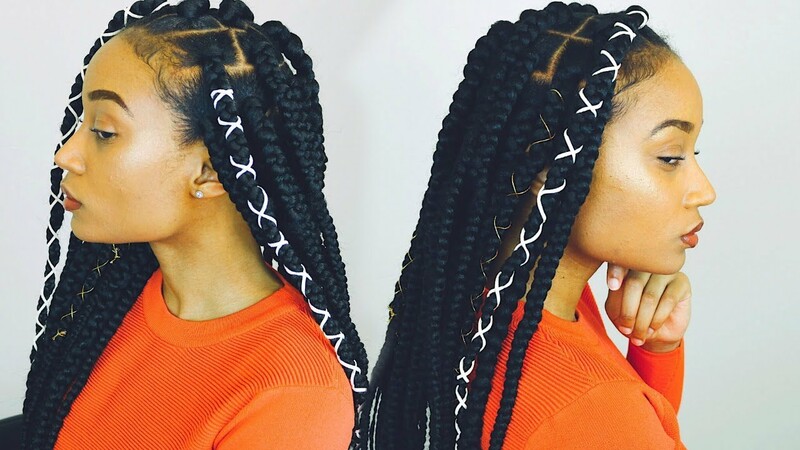 This method will allow the install and grip of the hair to be easier, ease the tension of the braids, and your hair is already pre-sectioned for braiding. The Brillant Beauty - How to: Box Braids | Rubber Band Method | Won't Pull Your Hair Out! Naptural85 - Removing Rubber Band Braids - BREAKAGE!? When stretching the braiding hair, my hair was pretty long (waist length). I decided to keep my hair long, with no cutting necessary. Then I boiled my braids (no burning) to seal the ends. When I was done with my braids, I added some edge control to my edges and oil to my scalp. This style took 4 hours to do. Honestly this was the easiest style that I could do with some weave! I was pretty intimidated with using rubber bands in my hair. I did so much research to make sure I would be able to pull this style off. The braiding hair I used made this braiding process so easy and stress-free. The hair is tangle-free and it was easy to work with. With this being the first time braiding my own hair with weave, I am pretty happy with the results. I kept this style for 3 weeks...only because I wanted something new. This style could have last longer! Natural hair says: if you are planning to get your hair in a long-term style, pamper your hair on your own by following these steps. You want to minimize the stress on your hair as possible. *This is a product review for Sensationnel African Collection Jumbo Braid, which was purchased with my own money and is my honest review.